I have a husband who has a great attitude, he enjoys going to the fabric warehouse with me! He also comes in handy as we like to dig through the ten rows of ‘stacks’ aka flat fold fabric going for $2.49 a yard for some great designer finds. Since the stacks are about five feet high, it takes some muscle to pull up enough for me to drag out the one on the bottom that has attracted my attention. On almost every trip to the fabric warehouse, my husband is attracted to the richly hued yardage with the gold highlights. It is probably due to his slight color blindness as these colors seem to come in clearer to him than the usual fabrics. And, on almost every trip, he talks me into getting a yard or two of these fabrics. After years of going to the warehouse, I accumulated a good amount of these pretty pieces. Inspiration struck! I decided to cut out pieces for all of them and turn them into a new quilt for our bed for my husband. 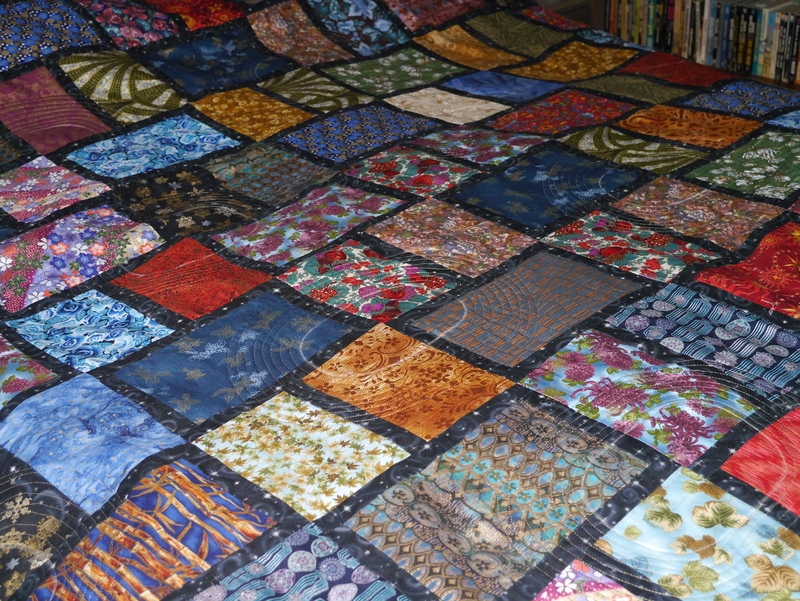 Today, I finished the main body of the quilt and just have to put on the borders and the appliques I ‘sign’ with on the back of the quilts. Although he knows I’ve been working on this – it is hard to disguise that large a project – he hasn’t seen it at this stage.